GPS Systems For Cars - In Dash Navigation vs Portable Devices! GPS Systems For Cars – In Dash Navigation vs Portable Devices! 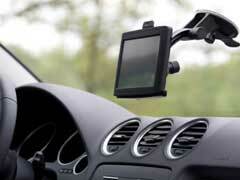 If you are shopping for GPS systems for cars you’ll notice there are several different types available. One of the more popular options is portable navigation systems as they give drivers the ability to use these on multiple vehicles. Another option available is an in dash navigation system. These are usually installed at a dealership or if you buy a newer vehicle, they may come equipped with one. When buying GPS systems for cars, here’s a look at which one would be more beneficial for you. In dash systems do offer a sharp design and are functional. If you want to incorporate one into your entertainment console this is the route to take. With that said, these are the more expensive option of the two as they can cost you a large chunk of money to install. Further, many drivers do not like these units as you have to stop the car to program them and upgrades to the software can be pricey. Meanwhile, portable units can offer more functionality and they are easier to update from a software standpoint. They are also more versatile as you can use them in a variety of vehicles. They are less expensive and some models come with innovative features like Bluetooth calling, Wi-Fi connectivity and voice commands. When comparing the types of GPS systems for cars available, the portable units are the better option. They have outstanding benefits, are easier to update and you can use them more. Along with this they are much less expensive, which can add a huge appeal for drivers. While the in dash units provide a more uniform look, many drivers believe they are too cumbersome to use and they are expensive to update. To buy GPS systems for cars you can stop by your local electronics store. Another excellent option to look into is shopping online as many websites have a huge selection of parts, which can save you money. Along with car navigation systems, websites like Amazon have many other accessories you can add to your ride like rear view camera systems.